WWE Money in the Bank 2017 took place from the Scottrade Center in St. Louis, Missouri on June 18th. The event consisted of seven matches. One of which took place on the event’s Kick-Off. - Carmella became the first-ever winner of the women’s Money in the Bank ladder match with a victory over Charlotte Flair, Natalya, Tamina and Becky Lynch. James Ellsworth retrieved the briefcase on behalf of Carmella. The decision was reversed a couple of days later. 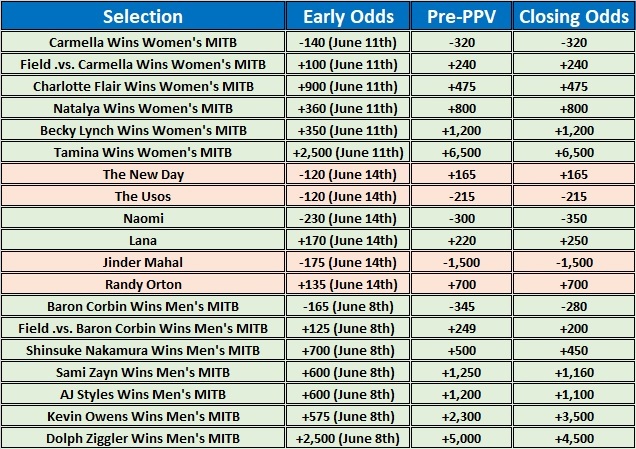 However, from a betting perspective, Carmella’s win counts. - The New Day scored a countout win over WWE Smackdown Tag Team Champions, The Usos. - Baron Corbin won the Money in the Bank briefcase against Shinsuke Nakamura, Kevin Owens, AJ Styles, Sami Zayn and Dolph Ziggler.